Ranthambore is popularly known as the Tiger reserve of the north-west, but one is surprised to find that Ranthambore is also a sustainable habitat for migratory birds that arrive during the winters, courtesy the large water bodies in the park and around area. Apart from the migratory birds the resident birds of Ranthambore are a sight to treasure. The reserve is home to over 300 species of birds. A keen birder can easily count net over 120 species in 3 days. Though the park is great for birding but the restrictions that are placed inside the Ranthambore National Park, may not appeal to the very serious birders. 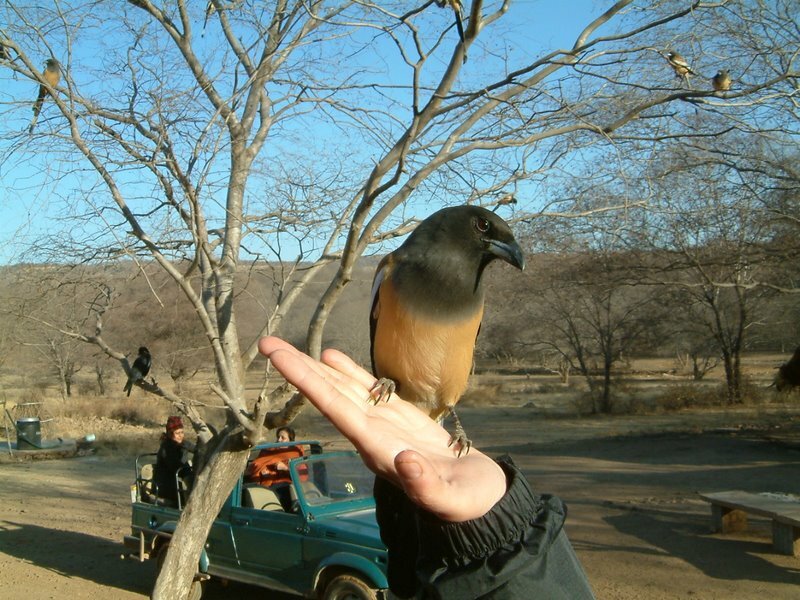 Bird watching tours are done by a jeep or canter safari inside the park. Some of the best locations for bird watching in the park are - Malik Talao, the Ranthambore Fort, Rajbagh Talao, Padam Talao and Jhalra area. There are some great birding spots outside the park and here one can walk around, which you cannot do inside the park. In fact, some of the best birding areas are on the outskirts of the park is Soorwal Lake, Mansarowar Lake, Amlideh (Banas River) and Helipad area. The most important birs in Ranthambore include's Indian courser, Painted spurfowl, Indian skimmer, quails, larks, pipits, prinias,Graylag Goose, Woodpeckers, Indian Gray Hornbills, Common Kingfishers, Bee Eaters, Cuckoos, Parakeets, Asian Palm Swift, Owl, Nightjars, Pigeon, Dove, spoonbills, kingfishers, quails, storks, geese, Crakes, Snipes, Sandpipers, Gulls, Terns, Great Crested Grebe, Eagles, Darters, Cormorants, Egrets, Herons, Bitterns, Flamingos, Ibis, Pelicans, Storks, Pittas, Shrikes, Treepies, Crows, Orioles, Cuckoo-Shrikes, Minivets, Drongos, Flycatchers, Ioras, Wood Shrikes, Pipits, Bayas, Sparrows, Finches, Wagtails, Munias, Bulbul, Mynas, Falcons,grey legged goose, pintails, and shell ducks etc. Soorwal Lake located around 10 km from Sawai Madhopur. This is a shallow seasonal lake, situated between acres of agricultural fields, which usually dry out by April/May. This is home to a large number of different kinds of migratory birds during the winter. Painted storks, flamingoes, spoonbills, sarus cranes, greylag geese amongst others can be seen in large numbers in between the months of November and March. During this season, the best time to see birds is very early in the morning and serious bird watchers should be at the lake before sunrise. Mansarovar is largest lake in the area and around 15 kms from Sawai Madhopur. This water bodies on the edge of the park attract thousand of migrating bird during winter and are specially exiting for bird watching. You can see pintail ducks, geese, pelicans and herons in large numbers. Some time in this area we can find some wild animals also, there is fisher men with the boats also we can hire those boats for boating in this lake. Amli-Deh is approximately 40 km far from Sawai madhopur. This place is home to different kinds of birds and animals. It is a very quiet and good spot for bird watching, the best place for Indian skimmers and River lapwings. During the drive to Amli-deh you can observe village life and Rajasthani culture. You can enjoy a camel ride in the desert as well as go boating on the Banas River.